As part of a Jane Goodall-inspired community action group, "Saving Pan" includes recipes from Michelle Obama, Michael Pollan, and world-famous chefs. When Brooke Abbruzzese was in sixth grade, she had no idea what to expect when she wrote First Lady Michelle Obama to ask for her favorite vegetarian recipe—or if she’d even get a response. But a month later, she found in her mailbox a formal-looking envelope fastened with the official White House seal. “I was like, ‘What the heck! Why is there something from the White House in our mailbox?’” recalled Abbruzzese, who is now 14 and a freshman at Grant Park High School in Portland. Obama’s recipe—for White House Kitchen Garden Cucumber Soup—joins recipes from Michael Pollan, and chefs Thomas Keller and Ina Garten, and many other luminaries in Saving Pan, a new cookbook created by Abbruzzese and 13 other Portland teens. The cookbook benefits the work of the Jane Goodall Institute’s Tchimpounga Sanctuary in the Republic of the Congo. “In sixth grade, I was really into the environment, and I wanted to help give back,” said Abbruzzese, who admits to an obsession with Goodall. She met a primatologist friend of her father’s who told her about Roots & Shoots, the Goodall Institute’s youth-led community action program. Abbruzzese was inspired to form a chapter in her own community, drawing mostly from her classmates at Portland’s Beverly Cleary School. After researching why chimpanzees are endangered, the girls decided to focus on raising awareness of the illegal bushmeat trade, which is one of the biggest threats to chimp populations in Africa. “I got a group of people together and we brainstormed, and that’s kind of how the cookbook came about,” said Abbruzzese. Saving Pan is a collection of vegetarian recipes that Abbruzzese and her classmates created over the course of three years. The title refers to the genus name for chimpanzees (Pan troglodytes) and bonobos (Pan paniscus), but also to that most important cooking tool (the cover photo is a blackberry cobbler cooked in a cast-iron pan). The cookbook was published in December and has already sold 800 copies—not bad for a self-published cookbook that so far has only been sold in Portland. The students have been featured in local news reports, and their U.S. Representative, Earl Blumenauer, recognized their achievement during a congressional session in December. And Saving Pan has already raised $8,000 to protect chimpanzees in Africa. And the great apes need as much help as they can get. At the end of the 19th century, chimpanzees numbered as many as 1 million. Today, because of deforestation and illegal hunting, they are endangered. They have already disappeared from four African countries and are nearing extinction in many others. In fact, according to the World Wildlife Federation there are fewer than 250,000 chimps left in the wild. Each Roots & Shoots project is supposed to be rooted in the chapter’s community, so the students—knowing Portland is recognized for its culinary scene—decided to engage local chefs. (The cookbook eventually grew to include chefs from all over the country—and even Canada, France, and Spain.) They thought a vegetarian cookbook would be a great way to educate others about the bushmeat trade in Africa and its effects on remaining chimpanzee populations. “Because we’re trying to stop the hunting of animals, we thought that promoting vegetarianism would be a really good way to do that,” Abbruzzese said. Putting a vegetarian cookbook together involved writing to food-world leaders like Michelle Obama as well as the chefs at nationally known veg-centric restaurants like Angelica’s Kitchen in New York City (which has since closed), Greens in San Francisco, and the Green Door in Ottawa. The students went door-to-door in Portland, asking celebrated local chefs including Jenn Louis, Kelly Myers, Sarah Pliner, and Jaco Smith for recipes. And the book also contains favorite recipes from the girls’ families: Aunt Debbie’s Artichoke Lasagna, Grandma Eastman’s Macaroni & Cheese, and the blackberry-blueberry cobbler shown on the cover. A Jane Goodall collage, from Saving Pan. Over the course of three years, the students gathered to test recipes on Friday nights. “The Friday I joined, they were doing the Michelle Obama recipe. So, I was like, ‘This is even cooler than I thought,’” said Emma Francioch, 14. To avoid the chaos of too many cooks in the kitchen, half of them cooked, while the other half worked on the collages of the chefs that illustrate each recipe. They learned basic cooking skills from each other, through trial and error, and from the hosting parents. “They even had to clean up their own mess!” said Shanta Abbruzzese, Brooke’s mom. 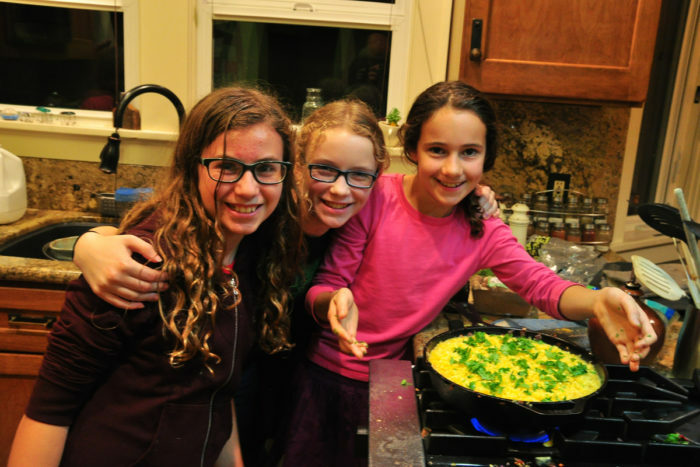 The girls had some surprise favorites, including lime-tofu wraps, Moroccan chickpea soup, “Soba Sensation,” and Michael Pollan’s “Any-Veggie Frittata.” Stokes, who usually doesn’t like coconut, was surprised by how yummy the roasted cauliflower in a creamy coconut fennel sauce was. (Chef Roy Farmer at the Green Door in Ottawa contributed the recipe.) “I need to make that again. I just love this recipe!” she said. Many of the girls became vegetarians on and off throughout the project; Abbruzzese became a vegetarian because of the cookbook—and remains one today. “I fly fish and she’s prohibited me from keeping what I catch. I have to throw it back,” says Brooke’s father, Chris Abbruzzese. Working on a project that took three years to see through was tough. “There were definitely times where I was like, ‘Is this really gonna happen?’” said Stokes. Ultimately the project taught them not only how to cook and work effectively in a large group but the value of persistence and dedication. Saving Pan is available for purchase online at SavingPan.com, or at A Children’s Place Bookstore in Portland.